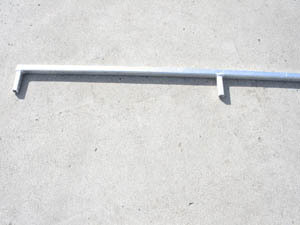 Assembly of the components of the Kayak Cradle is straightforward. 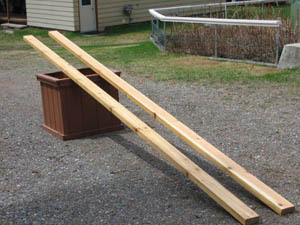 If you are providing your own 2x4's, obtain two top grade (smooth on both sides) 12 foot long cedar 2x4' s from a local lumber yard. Add a coat of water seal (Johnson's Water Seal or a similar product) to the 2x4's and allow to dry. The railings have pegs welded to them. These pegs fit inside the outside support arms of the Kayak Cradle. Insert the pegs into the outside support arms and fasten each peg with two 1/4 inch SS bolts (the shorter bolts included in the package) and nuts. Clamp the water-sealed 2x4`s to the bottom of the ribs so that the holes in the rib bottoms line up with the center of the 2x4`s at each rib. 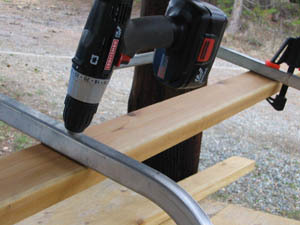 Drill a 1/4 inch hole using a spade bit inserted through the holes in the bottom of the ribs of the Kayak Cradle, drilling completely through the 2x4`s clamped to the ribs. Work from the bottom of the ribs. 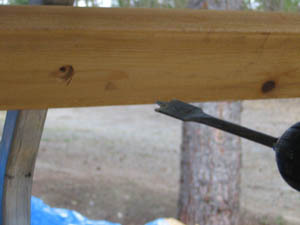 Using a 3/4 inch spade bit, enlarge the holes in the top side of the 2x4's making the enlarged hole deep enough to countersink the washer and bolt head so that they cannot touch the kayak when placed in the Kayak Cradle. 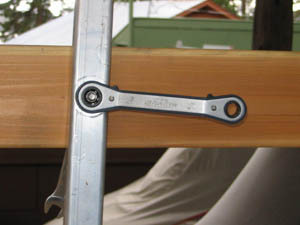 Tighten the self-locking nuts on the bolts fastening the 2x4's to the ribs of the Kayak Cradle, using two 7/16th inch wrenches. 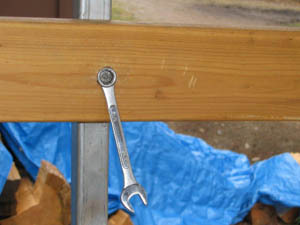 The washers and bolt heads are countersunk on the top of the 2x4's and the self-locking nuts are tightened against the bottom of the aluminum rib. The Kayak Cradle is now complete except for attachment to the dock. 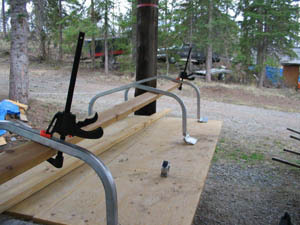 Place the Kayak Cradle upside down on the dock with the pieces of flat bar attached to the inside arms of the cradle and placed where they are to be attached to the dock. Pre-drill holes through the holes in the pieces of aluminum flat bar and into the dock. 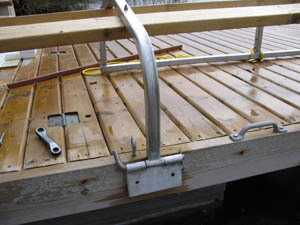 Fasten the pieces of flat bar to the dock using the 3/8" ss lag bolts (3" or 2" long depending on the thickness of the wood to which the cradle is being attached). 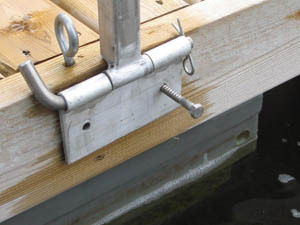 Once it has been fastened to the dock, the cradle can be rotated into the water ready for use.